Like the tenth Nike Hyperdunk and first Air Jordan, the Adidas Dual Threat feels very supportive according to some basketball players. They observe that it supports the ankle and arch so well. Several users are declaring that these basketball shoes are very comfortable to wear. A good number of buyers are highly satisfied with the Adidas Dual Threat 2017. They are claiming that it performs just as well as pricier brands. Many say that this shoe is significantly more affordable than many others. These are good quality basketball shoes, many purchasers declare. A handful of reviewers note that the Dual Threat 2017 fits them pretty well. Some purchasers are disappointed with the shoe’s poor quality. They are claiming that these basketball shoes start falling apart almost immediately. The Adidas Dual Threat 2017 is not suitable for outdoor use, several players note. The traction wears down easily, and the materials rip right after a few plays. A few wearers notice that these Adidas basketball shoes run small. They advise going a half size up. These basketball shoes do not have enough traction according to a handful of users. The traction pattern picks up quite a bit of dust on indoor courts, a small number observe. The Dual Threat 2017 is another good budget model from Adidas Basketball. It is a supportive and comfortable basketball shoe that offers a solid on-court experience at a budget-friendly price. However, its cheap price tag may also come at the expense of quality. 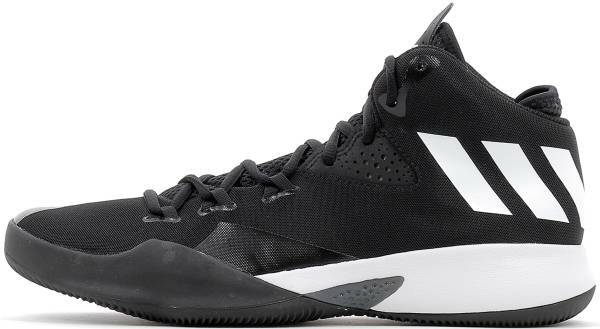 So, if you can spare a few more dollars, it is not a bad idea to pass on this Adidas model and invest in a more durable basketball shoe. The Adidas Dual Threat 2017 helps you beat your opponents on both ends of the court. Keeping you fresh from tip-off until the final buzzer, these basketball shoes deliver all-game comfort with its breathable mesh upper and updated cushioning. You can become an offensive and defensive threat when you suit up the Adidas Dual Threat basketball shoes. Cushion. The Adidas Dual Threat has a foam midsole that offers lightweight cushioning and total comfort. Whether you are shooting, dunking, or grabbing a board, the midsole is designed to soften your every landing. Traction. The Dual Threat 2017’s outsole is made of solid rubber and has a circular traction pattern that delivers impressive on-court grip. This circular design is perfect for quick directional changes. Length and Width. The Adidas Dual Threat 2017 is marketed as being true to size, but consumers are reporting that it runs a bit small. They advise going up half your actual size when ordering these basketball shoes. Lockdown. The Adidas Dual Threat’s lace-up closure features webbing in the forefoot that provides a locked-in fit while its padded mid-top collar delivers an improved fit and comfortable support around the ankles. The Adidas Dual Threat 2017 has a breathable mesh and synthetic upper that keeps your feet cool and contained the entire game. The lightweight upper also has TPU overlays on the toe box that extends to the shoe’s medial side for added durability and containment. The Adidas Dual Threat 2017’s updated mid-top profile offers the perfect blend of comfort, support, and stability. Its lightweight design and breathable upper will keep you looking and feeling fresh all day. The Adidas Dual Threat 2017 has three colorways to select from. It is available in Footwear White, Core Black, and Scarlet.